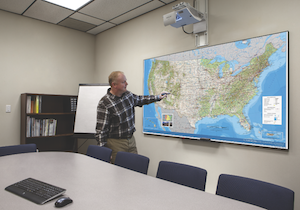 Draper has introduced a new interactive “whiteboard” screen to be demonstrated at InfoComm 2014. Draper’s Scribe Interactive Screen is a rigid front projection screen for use with ultra-short throw projectors. The strong protective coating allows you to write directly onto the screen with a dry erase marker. The Scribe Interactive Screen’s protective coating is designed to reflect less light than is typically seen with so–called “whiteboard” screens, so your projected content isn’t washed out in bright classrooms and meeting rooms. The coating wipes clean easily with an eraser. In addition, the Scribe comes with a low profile frame, and is magnetic as standard—not an add-on. To learn more, stop by booth C7425 at InfoComm 2014, or visit www.draperinc.com/go/scribe.htm.